UPDATE - We are excited to announce that we've moved to 2376 Lyell Ave, Suite 3, in the Lyell Howard Commons plaza, conveniently located across from Wegmans near 390. We are currently meeting with a limited schedule while undergoing the last stages of renovation. Our sign is currently in production; look for our entrance under the big Olympia Family Restaurant sign. Our logo is on the door. Please check our Facebook for more details! 7 Star Praying Mantis Kung Fu is considered by many to be one of the first forms of MMA, being a combination of the best techniques from 17 different styles of Kung-Fu combined with the the fierce, lightening-fast predatory style of the praying mantis and the extremely efficient footwork of the monkey. Our classes cover every aspect of Martial Arts from Long, Short, and Grappling Empty hand techniques to 18 different weapon styles, from short weapons to long weapons, from singled handed to dual wielding. We pride ourselves on teaching all application oriented skills. 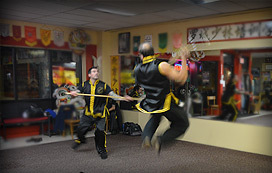 Rochester Shaolin adheres to the traditional methods passed down from Lo Kwan Yu to Chiu Chi Man to Grandmaster Lee Kam Wing. 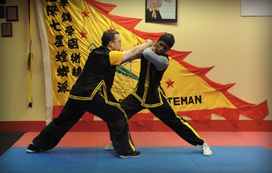 Sifu Bateman, a Closed Door Disciple of Grandmaster Lee Kam Wing, is one of only a few 8th Generation successors to the style, and the only 8th generation disciple in Upstate NY. We welcome you to come and watch any class you may be interested in, or to participate in any of our informal martial arts classes to see if they're right for you. Please contact us to schedule a time with us at the Academy.